We’re well on our way to a world where everything – from your refrigerator to your car – is connected via the internet. And while some of these connected devices like smart lights and smart speakers already enjoy mainstream status, others have yet to break out of their niche. So which of our household objects do we feel is going to be next on the list to get the smart treatment limelight? Smart locks. A number of these intelligent deadbolts have popped up on the market over the past few years, and within the next five years could be a common feature on every tech-lover’s abode. But why buy one in the first place? Well, the lock you have on your door right now may serve its purpose, but it’s not terribly convenient. How keys have you lost over the years? How many times have you dragged yourself off the couch to answer the door? Smart locks change that by locking the door automatically when you leave or enter and unlocking the house from a few taps on your cellphone or tablet. Of course, not all smart locks are the same. That’s why we’ve put together this guide – to help you decide which smart lock to buy, how to install it, and more. As mentioned, not every smart lock is the same – different locks use different protocols, different ways of unlocking, and more. #1. Is your door compatible? Smart locks are aimed at ensuring your deadbolt can automatically lock and unlock, but not every single door will work properly. If you go to your deadbolt and lock or unlock it, it should do so in an easy, smooth motion. If you need to push or pull on your door to properly lock it, then a smart lock may not work properly – you won’t be there to push or pull when your door is locking and unlocking itself. You’ll also want to make sure the lock is able to fully extend into the jamb. Your smart lock will always try to extend fully, and if it can’t the locks motor might get burnt out more easily. Of course, both of these issues can be fixed, but you’ll want to make sure they are before you try and install your smart lock. #2. Do you want to replace your deadbolt, or add on to it? Not every smart lock serves as a deadbolt – but most do. Still, some, like the August Smart Lock, simply attach onto your existing deadbolt and do the manual locking and unlocking for you. These are generally a little easier to install, but you’ll want to make sure that they’re compatible with your deadbolt before you buy them. #3. How would you like your smart lock to connect to the internet / your phone? There are a few different connection standards used with smart locks – as is the case with any smart home device. Most will use multiple standards to connect to your phone and other devices, but you’ll want to check the lock before you buy it. The first, and perhaps most common, standard is Bluetooth. It’s common because it doesn’t use much power, especially compared to Wi-Fi. That’s an important thing to consider, since most smart locks will be battery powered. Bluetooth, however, only works within a certain range. So, that said, if you’re not near your lock, you won’t be able to lock or unlock it. The good thing about Bluetooth, however, is that you don’t need another hub to use it. Another standard is Z-Wave, and it requires a separate hub in order for you to be able to control the lock from your smartphone. Normally, that hub also connects to Wi-Fi. Z-Wave has a range of around 120 feet, however if you have multiple Z-Wave devices, they can each act as a range extender so, with enough products, the range can be extended to up to 600 feet. An example of a Z-Wave hub is Samsung’s SmartThings. The third and final common standard is Wi-Fi, and it’s normally available as an optional add-on – like on the August Smart Lock. In that case, you’ll need to buy a separate component that connects to a power-outlet and then bridges the connection between the lock’s Bluetooth and your Wi-Fi. The plus side of that is that you can control the lock anywhere you have Wi-Fi – so if you’re on holiday and your friend needs to get in, you can unlock the door for them. #4. How do you want to unlock your lock? Most smart locks also have a traditional keyhole so if you don’t necessarily feel comfortable relying on your smart lock 100% of the time, then you don’t have to. Still, some smart locks are keyless, so you’ll need to consider whether or not that’s something you’re comfortable with. Of course, some locks use something else over a keyhole – for example, many of them have a touchpad with which you can install a PIN code to unlock them. Before you buy a smart lock, there’s something you should know: smart locks are helpful because they’re convenient – not because they’re necessarily more secure. Most smart locks still use the same old dumb deadbolts, they just make using those deadbolts a little easier. If you think a smart lock is going to make your home a lot more secure, you may be disappointed. August Smart Lock: This lock attaches to your existing deadbolt and offers a simple app with Apple’s HomeKit, Nest, and IFTTT integration. 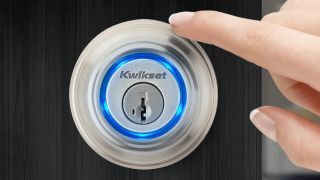 Kwikset Kevo: All you need to do is touch this deadbolt-replacement lock to unlock it – provided you have the right accompanying smartphone. Schlage Sense: Thanks to its HomeKit integration and the ability to create guest entrance codes, the Sense is perfect for the iPhone user on the go. Yale Real Living: Yale’s Real Living deadbolt lock comes with Z-Wave and Zigbee connectivity, meaning its a great choice for those that want to use their lock with other smart home devices. Lockitron Bolt: This one is the cheapest lock on the list, and while it only connects via Bluetooth, if that’s all you need there’s no need to spend extra on something more expensive. So you’ve done the research and now have a shiny new smart lock, but how do you install it? Turns out, you don’t necessarily need to hire a locksmith to get your lock all set up. It’s important to note that smart lock installation varies widely for each product, so you’ll want to read the instructions for the lock that you end up buying. How you install your lock also varies depending on the type of lock that you buy – if you buy a full deadbolt replacement, you’ll obviously need to take your deadbolt out. If, however, you buy something like August’s Smart Lock, your deadbolt will remain installed in your door. Follow these steps to install a deadbolt replacement lock, such as the Kwikset Kevo. Remember, specifics to the instructions will vary depending on the lock, so for a more detailed look, follow the instructions that come with your lock. First, take the screws out on the side of the door and on the face of the deadbolt. Once unscrewed, the two sides of the deadbolt should easily come off the door, after which you can slide out the deadbolt itself. Next up, you’ll slide the deadbolt into the space on the edge of your door, then screw the bolt piece firmly in place. Next, feed any wires on the front of the deadbolt lock through to the back. Most locks will have a back plate that you need to install, being careful to thread the wires through the appropriate holes. Last but not least, slot any batteries that need to be installed into the front of the lock, connect the wires, and slot the lock into its place. If you get a lock like the August Smart Lock, which doesn’t replace your lock but rather motorises it, the installation process is a little different. Tape the exterior part of your deadbolt look to the door. This prevents it from falling out when you unscrew the other side. Unscrew the interior part of your deadbolt lock, which is usually held in place with two screws. Screw in the metal mounting plate into your deadbolt. Insert the plastic adapter that best suits your lock. Slide the actual lock onto the plate and make sure it’s secured. Now that your smart lock is installed, you should be able to unlock it and lock it again quickly and easily using your phone. Again, this will depend on the model you get, but most locks use Bluetooth as a proximity sensor, and with many of them you can simply tap on the lock to lock it or unlock it. Not only that, but many will unlock automatically when they detect that you’ve moved away from the lock. As you can see, smart locks are extremely simple to use, install, and monitor. Sure, they all work a little differently, but the point of them is convenience, and most can be installed in 10 minutes or so without needing to call a locksmith.